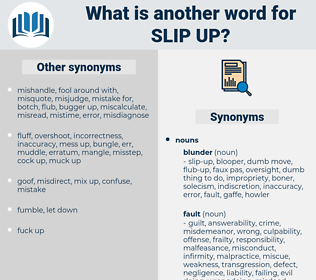 What is another word for slip-up? correctness, fix, care, perfection, success, right, accuracy, correction, restitution. benefit, strength, strong point, advantage, irresponsibility, soundness, behavior, kindness, propriety, obedience, remembrance, blessing, good deed, good. judgment, thoughtfulness, discretion, seriousness, wisdom, discreetness.